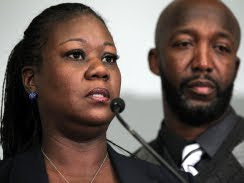 (Yahoo) -- Trayvon Martin's mom Sybrina Fulton said in an interview on the "Today" show Thursday that she believes it was "an accident" that George Zimmerman shot and killed her son in Sanford, Fla., on Feb. 26. "I believe it was an accident," Fulton said. "I believe that it just got out of control, and he couldn't turn the clock back. I would ask him, did he know that that was a minor, that that was a teenager and that he did not have a weapon? I would ask him that I understand that his family is hurting, but think about our family that lost our teenage son. I mean, it's just very difficult to live with day in and day out. I'm sure his parents can pick up the phone and call him, but we can't pick up the phone and call Trayvon anymore." Zimmerman, who is being charged with second-degree murder, is currently being held in protective custody at the Seminole County jail, awaiting a court appearance. Earlier in the interview, Fulton said she is prepared to endure the trial, "even if that means that he may be found not guilty." "We just want him to be held accountable for what he's done," Fulton said. "And by him not being arrested, that would not have been done. So we are happy that he was arrested so that the committee gives his side of the story." Tracy Martin, Trayvon's father, said he believes police bungled the investigation, which led to the delay in Zimmerman's arrest. "First and foremost, I think had the Sanford Police Department done a thorough investigation from the beginning, George Zimmerman would have been locked up from day one, and there wouldn't have been such a huge public outcry for the arrest," Tracy Martin said. "And if, in fact, we had to plead our case to public officials just to get him arrested, if that's what we have to continue to do to plead our case, then that's what we'll do." I really do admire these parents. They carry themselves with dignity and grace but do not hide their pain, grief and frustration. I echo the attorney and Al Sharpton that we should follow their example as far as how to conduct ourselves. Based on everything that I've learned about the case, I do not think that George Zimmerman woke up planning to kill someone. I do not think that he got out of the car planning to kill Trayvon. But I do think, like Bill Cosby said, that having a gun emboldened him to pursue Trayvon. I can't buy the self-defense argument because he brought the situation upon himself. He had an easy out. Didn't even have to get out of his car. But he did and now he has to deal with the consequences. The Sanford police department should be embarrassed and disciplined. It makes no sense that someone else can come in weeks later and make such a determination. If they had a reasonable story and evidence of self-defense, they should have been able to explain everything to Trayvon's parents and attorneys. Instead they were indignant and dismissive. Hopefully this will be a turning point for the better for law enforcement in that area. I was not happy with her interview this morning...I was going to write a commentary about it but I knew it would not go over well.... I applaud them for bringing the media spotlight in this case and forcing the officials in Florida to do their jobs and investigate their son's death... I applaud them for pushing for justice but I think what she said today undermined all of her hardwork... First of all, I don't believe she realized that her use of the word "accident" has legal repercussions... she has given Zimmerman's defense team ammunition to stand up in front of a jury and say, the victim's mother thinks it's an accident but the State wants you to convict him of second degree murder and put him in jail for the rest of his life for an "accident".... No the evidence doesn't indicate that he intended to kill Trayvon or anyone else that day BUT his behavior was reckless and because of his recklessness (ie following Trayvon after the operator told him to stop, confronting Trayvon, getting out of his SUV to do it) a 17 year old is dead. Preach! I think you should write that commentary because I was thinking the same thing.